The Multi-Dimensional Education approach provides you with a more comprehensive understanding of the systemic efforts of your school. This is why we refer to Multi-Dimensional Education as MDed (pronounced like a doctor named Ed: M.D. Ed). We see the education provided within schools as a system that has many parts. It is the sum of these parts that create the synergy needed to help students and teachers succeed. Some of these parts you have more control over than others. Some of the parts (e.g., finance) you might have little control over. But the sum of the parts creates the synergy needed to generate the energy to improve. And if we can more accurately monitor the functionality of the more meaningful parts and more closely assess the impact they are having, the better chance we have to offset the possible negative impact. Our assessment tools have been used in more than 25 states and 70 districts. We have worked with many school level and district educators. Our Multi-Dimensional Needs Assessment can provide you with assessment, support and training needed to not only identify your strengths and challenges, but also provide insights as to which facets within your schools are contributing to or detracting from academic achievement. More than 6 years of federally funded random trials have validated our Multi-Dimensional Needs Assessment (MDA). 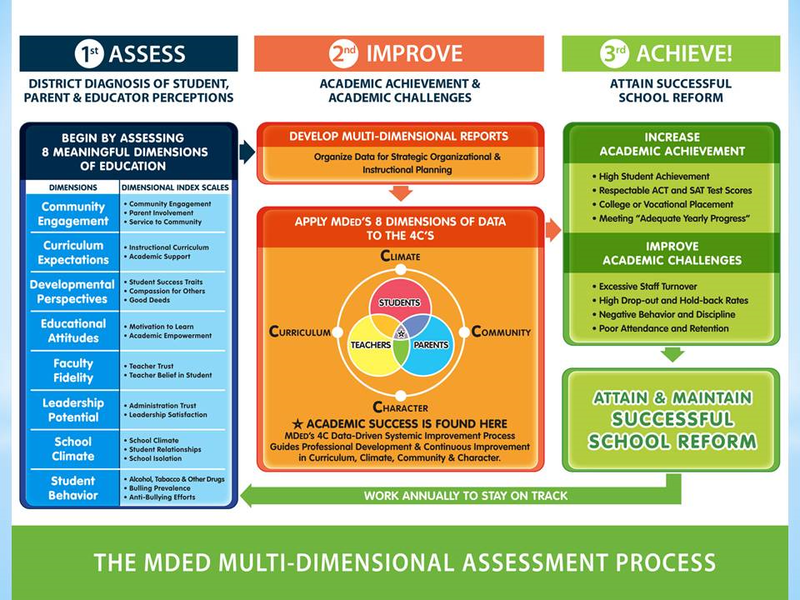 The MDA captures data from your students, parents, and educators on 8 dimensions essential to education success! For larger evaluation efforts, our analysis can incorporate your academic achievement and challenge data to provide you with reports that not only provide a more robust documentation of how you are performing, but also gives you evidence-driven solutions that show you what you need to fix to increase academic achievement and teacher performance! Most importantly, our reports are presented in a fashion that all stakeholders in your district can understand. Our reports also provide you with the graphics needed to create powerful PowerPoints to share with your staff and stakeholders. To us data is powerless if it is not meaningful to the educators and stakeholders that need to use the reports. Therefore, one of our goals is to provide you with reliable and valid data that is easily understood by education stakeholders. Our goal is to give your school or schools evidence they can use to inform their efforts. In the past we have worked with some of the largest districts in the nation including Hillsborough County Schools (Tampa, FL), Hamilton County Schools (Chattanooga, TN), and Fort Bend Schools (TX). We have also worked with larger charter school organizations such as National Heritage Academies. Most recently we have added on a system to offer Online Surveys and Data Management. This new system now allows us to work more efficiently and affordably with smaller districts and individual schools.